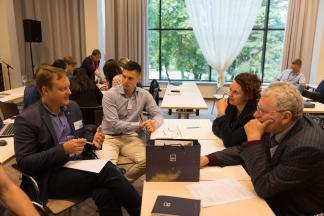 48 PhD students from more than 10 countries have participated in the 2nd International KTU PhD Summer School, organised by Kaunas University of Technology (KTU) together with partners – the University of Stavanger (Norway) and European Consortium of Innovative Universities (ECIU). The intensive three-day course was delivered by researchers from Norway, United Kingdom, Luxembourg and Denmark, and the students represented higher education institutions from Austria, Spain, United Kingdom, Latvia, Lithuania, Norway, Portugal, Russia, Slovakia, Turkey and Germany. The School focused on developing the transferable, or, so called soft or universal competencies. “Organising and working with the scientific research data, scientific articles’ writing and PhD thesis project management were among the study topics of the International PhD Summer School this year. To timely defend doctor thesis and to successfully integrate into the job market is very important for doctoral students from any study field and any university. We hope that intensive courses and social events provided a perfect environment for the young researchers to communicate, to share their experiences, to discuss and to create a contact network for future activities”, says Vita Daudaraviciene, Project Manager at KTU Doctoral School. The first day’s seminar “Writing for Scholars” was delivered separately for the social sciences and humanities, and for technology, natural and biomedical sciences students. The groups were taught by Lynn P. Nygaard (Peace Research Institute, Norway) and Jacek Fiutowski from University of Southern Denmark. On the second day, during the class “Project Management for PhD Students” Flavien Massi (Intelligentsia Consultants Sàrl, Luxembourg) was talking about peculiarities of project management, connecting this knowledge with doctoral thesis writing. On the third day, during the class “Open Science and Research Data Management: Tips and Tools to Help You Plan to Get the Most from Your Data” Sarah Jones (Digital Curation Centre, UK) and Iryna Kuchma (EIFL, Lithuania) were sharing know-how on the nuances of scientific data management. The experts were also providing feedback for presentations delivered by the teams of students. The organisers of the event are happy to note the increasing interest towards the PhD Summer School and attracting motivated and talented PhD students from across world. It is expected that the International PhD Summer School organised by KTU and ECIU will become a new tradition.